Do you have trouble giving your dog a pill? Unless it’s one of the chewable, beef-flavored pills, a lot of dogs will separate the tasty food from the pill with Houdini-like skill, swallow the food and eject the pill onto the floor. And, good luck trying to fool your dog a second time, right? 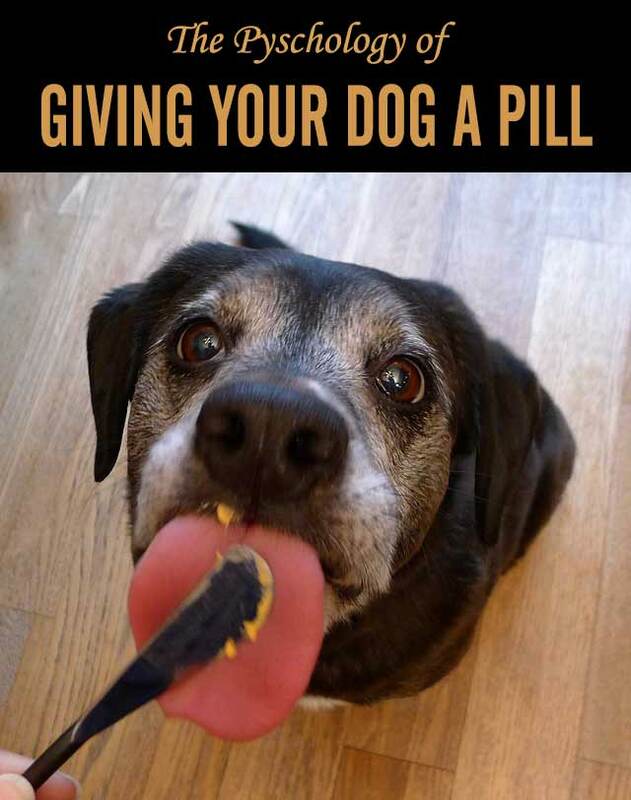 If you’re like me, you’ve probably already tried the common methods of getting your dog to take a pill, like hiding it inside food or one of those nifty pill pockets or crushing the pill and mixing it in with your dog’s food. Heck, maybe you’ve even tried pushing the pill into the back of your dog’s mouth or used a pill shooter device. Some of these methods can be stressful for you and your dog. Recently I had one of those “Aha” moments when Haley was outwitting me with her pill flicking routine. I realized that I wasn’t working with her nature, so I decided to try something different. I turned the tables on her with a little dog psychology in order to trick her into wanting to take her medicine. Yes, she may be a canine Houdini in the way she spits out those pills, but she’s not the only one that has a few tricks up her sleeve. 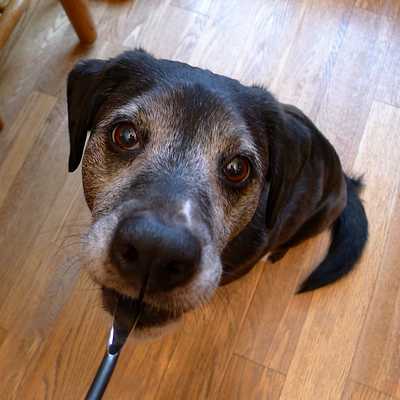 A quick note before we jump into the psychology tricks: Food is a great motivator for most dogs so most of these ideas involve food or treats. Check with your vet first to make sure your dog’s medication can be given with food or if there are any dietary restrictions. Dogs are masters of reading our body language and emotions. If you get tense or frustrated when you’re about to give your pup medication, they will quickly pick up on your feelings and become suspicious. Try to adopt a positive and relaxed attitude. In the same way dogs read our body language, they are keenly aware of our routines. Try giving the pills in different settings or at slightly different times of the day if possible. Also try preparing the pill with food ahead of time or while your dog’s outside so she doesn’t notice what you’re doing. Your dog is much more likely to gobble down the treat and pill if she’s hungry rather than offering it after she’s eaten a meal. 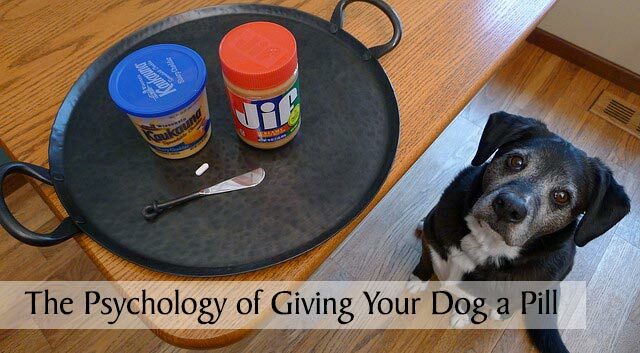 Tap into your dog’s favorite tasty treats or food to hide the pill. For Haley, that would be cheese or pieces of hot dogs. Peanut butter is also a great option. It’s never a good idea to chase your dog down in order to give them their medication. Walk away from your dog with the good smelling treat and they’ll likely follow you in hopes of getting a bite. Put your dog’s begging to good use and pretend you’re eating the food. 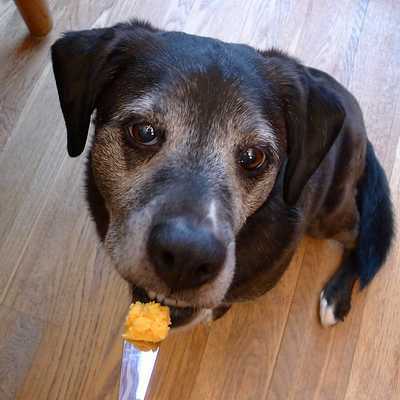 If you’re hiding the pill in food that you also happen to like, prepare a few bites for yourself and eat them first before giving your dog the one with the pill. If your pup’s good at catching treats in her mouth, toss her a few treats, then the one with the pill, followed by another treat. She’ll probably be so fixated on the game and the next treat that she’ll easily swallow the one with the pill. Another method is to have your dog perform a trick or speak before giving the treat. She’s more likely to eat it if she’s excited and thinks she’s earned it. If you have multiple dogs, take advantage of their competitive nature by giving both of them treats while working in the treat with the pill. You’ll only want to use this method if you can ensure the right dog gets the treat with the pill. Give your dog a piece of food, then the food with the pill inside, followed quickly by an even larger piece of food. Your dog will be anxious to get the larger piece and should quickly swallow the piece containing the pill. This uses the same principle as #9 above. 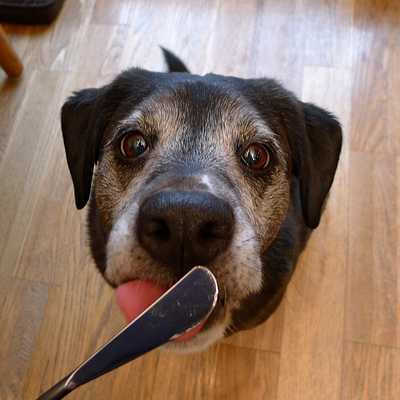 Once your dog licks the bulk of the food containing the pill off of the spoon, continue holding it in place so they’ll likely swallow the pill and continue licking the spoon. The two methods that work best with Haley are #9 and #10. I used to give her a cheese-covered pill and then stand back to watch that she swallowed it, or should I say, I waited to see if she would spit it out. Now, I always make sure she has something yummy to eat right after giving the pill so she swallows it quickly in order to get more, whether it’s another treat or the fact that she gets to lick the knife or spoon. If none of these methods work for your dog or your dog isn’t particularly food motivated, giving your dog a pill can be more challenging. Other options include talking to your vet to see if the medication comes in a flavored version or if the drug(s) can be custom made into a flavored compound or liquid. If the medication has a very bitter taste, ask if it can be put inside an empty gelcap to conceal the taste. Whether it’s psychology or just the basic nature of dogs, I find it a lot easier to work with their nature when trying to accomplish difficult tasks such as giving medication. Does your dog willingly take pills and medications? What tricks or tips have you discovered to outwit your Houdini hound? Elaine, we use the #8 (competition) strategy with great success! I slapped my forehead when I finally discovered it by accident 3 years ago. Since then I’ve only twice had to fish Zoe’s pill-pocket out of Zack’s mouth when I wasn’t paying attention to who was getting medicated and who was getting placebo treats. It’s funny how a little competition can make all the difference. Don’t you just love how we keep discovering these little tricks as we learn more about our dogs? Love all these suggestions. Mary is definitely the cheese dog. I’ve been lucky in that she rarely spits it out. She’s a gobbler. One cheese ball with the pill inside, I swear she ears it whole. Yes, cheese lovers unite! Haha ? Some people have had luck with burying the pill in a glob of peanut butter that then gets stuck to the roof of their mouth so they end up swallowing the pill. That one never worked with Haley, she would always manage to flick the pill out. I taught our dogs “peanut butter treat.” This is when I give them pills. All the dogs get a treat even if they aren’t getting a pill; this keeps them from getting suspicious. It came in handy when Scout was sick and needed to take pills. What a great idea, Kimberly! Having a cue to get them even more excited for treats makes a lot of sense. ? I like how you broke this down into a number of simple descriptions. It helps demysify the difference between people who have good dog skills and those who have trouble getting what they want from a dog. Usually it’s just summed up as one person “can do it” and the other “can’t.” Good dog “energy” can definitely be learned! That’s such a nice compliment and thanks so much for sharing the post, Emily! Thanks so much! I appreciate that. ? Th e routine thing cracks me up. On day one I always think I pulled one over on them. But by day three with the same routine they are spitting out the pill and eating the good stuff. I don’t give them enough credit sometimes. They are so smart and observant, aren’t they? Sometimes we have to get pretty creative to fool them, lol! OK … I just want to say I love that little gray face of Haley’s! So adorable! What usually works for Ace is #9 on your list, to have three pieces of something, say, a slice of ham ripped into three pieces. So I give him one piece of ham, which he inhales, then I give a 2nd piece really fast with the pill hidden and then as he’s still swallowing that I quickly give the 3rd piece so he doesn’t even realize what’s happened. That usually works. Aw, I love Ace’s gray face too. ? Although, I think Haley has a lot more gray even though she’s a year younger than Ace. I see it more on the back of her legs now too. Maybe one day she’ll be all gray, lol! I hope Ace is doing better with his drainage issue. Sending good thoughts your way. ? Excellent tips. I usually hide the pill in peanut butter and do a big build up like it the greatest treat they are ever going to taste. Works every time. Now the cat is a different story. She doesn’t eat treats and she is very picky. Ah yes, the cats are another story altogether, lol! It’s pretty hard to pull one over on them. Thanks for stopping by and also hosting the hop today! Cocoa is not food motivated at all. And giving her pills. Oh my goodness. She will keep it in her mouth and then go in the other room and drop it. I put it in PB and put it as far back as I can and hope for the best!! Ah, Cocoa is a very tricky girl by going into another room before spitting it out, haha! I’m glad the peanut butter trick usually works for her. Haley would never take a pill without hiding it in some kind of food. Great tips! Any time I need to give a pill, I ask for some kind of trick. They always go crazy for a “treat” if they have to work for it. Yes, it’s funny how that works when they feel they’ve earned it. Awesome! So many great tips in one place. You should turn this into an infographic to make it even more shareable. One of my foster dogs needed to take a particularly bitter pill (why can’t the pharma companies do something about that?). Neither peanut butter or cheese worked. But liverwurst did. I’ve never found anything stinkier or more reliable for even the most bitter pill. That’s good to know about liverwurst; somebody else mentioned it too so it must be pretty darn good. I’ve been wanting to put together some infographics, maybe I should work to get that off my “todo” list soon, lol! Thank you so much for joining the blog hop! There are lots of good tips in this post. Here’s the one we use. When Sampson had his ACL surgery and required pain meds as well as anti-inflammatories, it was frustrating. He was wise to it and after one horrible incident with me wrestling him, I knew there had to be a better way. I threw it out to my readers. One of them said Liverwurst. And it’s SO easy. You do use the treat, treat, pill, treat method with the pill either being in the second or third treat and rapidly dispensing the meat. BUT my guys LOVE that Liverwurst so much, they now will sit there and WATCH me put the pill inside and then gulp it down anyway. I no longer have to use a ton of treats. Just as many pieces of Liverwurst as there are pills. There was an herbal anti-inflammatory that had a bitter, strong taste, and a couple of times Sampson bit into the pill. When that happened I gave him a fresh piece of Liverwurst with NO pill in it and he was fine. It never kept him from taking the Liverwurst the next time. Thanks so much for your liverwurst tip too, Jodi. That’s a lot of votes for liverwurst! It’s awesome that you found something that works so well with Sampson because it’s no fun struggling with those pills. I’m going to have to pick some up and try it with Haley, although she might not go back to cheese after getting a taste of it, haha. Thanks for hosting the Thursday Barks and Bytes blog hop! ? Excellent post with great pill-feeding tips! Thankfully both Missy & Buzz have never had issues taking any meds, but I’ve had to trick a few of my client dogs into taking meds. I’ve always been lucky with a huge spoonful of peanut butter that hides the pill(s) nicely, as well as slices of cheese serving the same purpose. 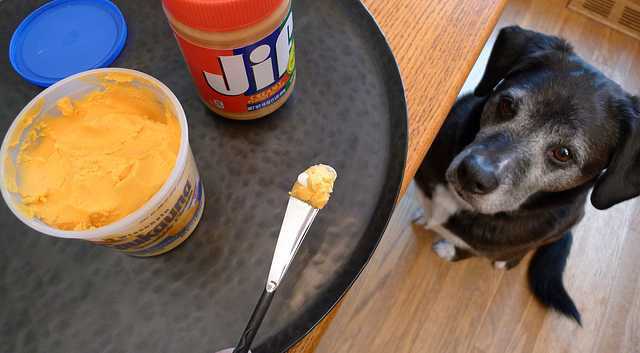 Peanut butter seems to work for a lot of dogs. Haley must be able to detect something hard in the glob of peanut butter and quickly finds the pill. Maybe switching from smooth to chunky peanut butter would help disguise the pill. I’ll have to try that. Those were 10 great tips. I guess I never thought of soft cheese like that, I will wrap my pills in a slice of processed cheese in which they do sometimes spit it out. I also will dig out a hole in a chunk of hotdog and slide the pill in. Hot dogs are probably Haley’s favorite, but we don’t buy them very often. I saw someone on the Internet using a can of spray cheese and they put the pill in the nozzle, then sprayed it into their dog’s mouth. That’s a novel idea, lol! Luckily, Pill Pockets still work with Maggie. Our Becca eventually refused everything and I had to resort to force. I hated it and so did she, but she had to have her meds. I remember growing up with dogs that we had to force them to take pills too. Sometimes that’s what you have to do though. I’m glad Maggie likes the pill pockets since it’s much less stressful for her. I hope she’s feeling good and having a wonderful weekend. ? Jasmine wouldn’t take a pill no matter what. She was even able to cheek it and spit it out after eating an additional treat. She had to be pillinated and it took a lot of skill. Cookie is pretty good about it. Gotta make sure it’s something she won’t try to chew otherwise shed discover the pill. I also give the first one “blank”. Cream cheese seems to work best. Oh my gosh, Jasmine was really determined to hide those pills, wasn’t she? My parents have used cream cheese in the past with their dogs too and it worked really well. So glad you stopped by today! ? i really never knew of the importance of feeding your dog a raw diet! This is great info for dog owners!Love it! You did a fantastic job. Hi Safa, I haven’t jumped on the raw diet bandwagon yet but here are two great sites if you’re looking for more information! You’re so lucky to have such cooperative pups, Jan! I’ve never had to give a cat a pill, but I can imagine that would be difficult.